DRI Delivers Halloween Costumes to Children's Hospital - Direct Recruiters Inc.
At DRI, we believe strongly that we have a responsibility beyond the walls of our building and the clients we serve. As community members with the attitudes and abilities to achieve, we feel it is both right and appropriate to be involved in local volunteer opportunities. 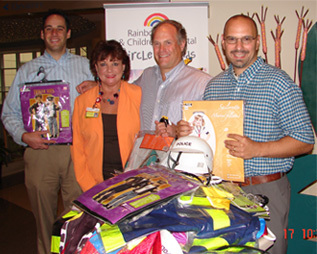 That’s why we recently became part of the Rainbow Babies & Children’s Hospital Circle of Friends, Cleveland, Ohio. In early October, our entire staff had fun shopping for 30 Halloween costumes for kids ages 2-5. 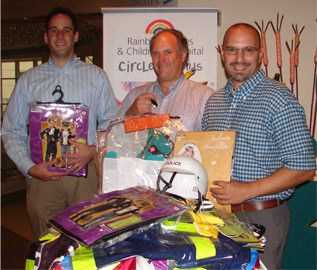 On October 17th, Shel Myeroff, President, together with Dan Charney and David Peterson, Managing Partners, were invited by Sharon Klonowski, Director – Rainbow Circle of Friends to personally deliver the costumes and tour the facility. And they had a great time doing so! DRI’s goal is to collectively improve our community and encourage others to get involved. Charitable giving is the right thing to do and we feel great about it!